Happy Monday fellow bloggers! It is a beautiful, sunny, WARM (not the norm) day in San Francisco!!! I hope you all had excellent weekends. I wanted to share my notes from the internet’s #1 artist radio blog-talk radio show (that I happily discovered). The blog radio show is called: “Artists Helping Artists” and the link is: http://www.blogtalkradio.com/artistshelpingartists. For those of you whom are not already aware, Leslie Seta, the show’s host, runs a weekly blog-talk radio program from her home in Pasadena, CA. Her radio blog is both informative and enlightening…for any artist…be it emerging (like myself), mid-career, or just plain stagnant. Her blog focuses on the business of marketing your art effectively, i.e. : how to manage your art business, sell your art, and potentially make a living from your passion. She speaks from experience as she is a successful oil painter. Her blog provides artists with a wealth of informative and achievable tips & pointers for artists to more successfully manage his or her art career. The most recent show I listened to garnered its’ idea from Stephen Covey’s wildly successful: “7 Habits of Highly Effective People”. The host, Leslie Saeta, tailored it to artists, specifically. Below is a summation of my notes…it is all paraphrased in order to keep it relatively short. I hope you find it both inspiring and helpful…I certainly did. HABIT #1: CHOICES ARE ALL OURS. My life is carefully designed by me. We can choose courage or we can choose fear. Every situation provides a new choice and we have the option to do it differently. Remember the joy and love of painting. Sometimes painting is difficult but you can say, “I may not like this painting today but what was it that I learned and why didn’t it work?” Be positive. Have a focused and consistent approach. This is difficult for artists. You are in charge. Remind yourself to maximize any opportunity that comes your way. Try one idea that is different every month. Be proactive. You won’t know until you try. HABIT #2: BEGIN WITH THE END IN MIND. Have an ‘end’ in mind so you can determine the path and how you are going to get there. To plan you need a vision. Successful artists see themselves achieving and working towards their goal. Take for example, getting into a gallery. Talking about it and doing it are two different things. We must understand the steps and the path it takes to reach your ‘end’ which is a synonym of ‘goal’. Is your art selling? You must do the research and due diligence which entails reading and investigating and planning to ensure you have a valid chance at success. When we don’t plan, we set ourselves up for failure. Enter into shows for galleries! Make a goal: “I want to start teaching workshops.” You have to plan in detail. Not every artist is a great teacher. Start with open studios once per week or once per month. Reach out to your local community. Do your research locally. Where can you publicize? Where can you hold the event? Be flexible. Don’t take anything personally. Don’t get discouraged. Get into smaller shows in order to get into bigger shows. HABIT #3: PUT FIRST THINGS FIRST. There is no need to over-extend yourself. Focus on your #1 priority. It is ok to say no. Painting needs to come first. You need to develop habits in order to be successful. Learn to say no and focus on what is important. CREATE STUDIO HOURS AND STICK TO THEM NO MATTER WHAT!!! 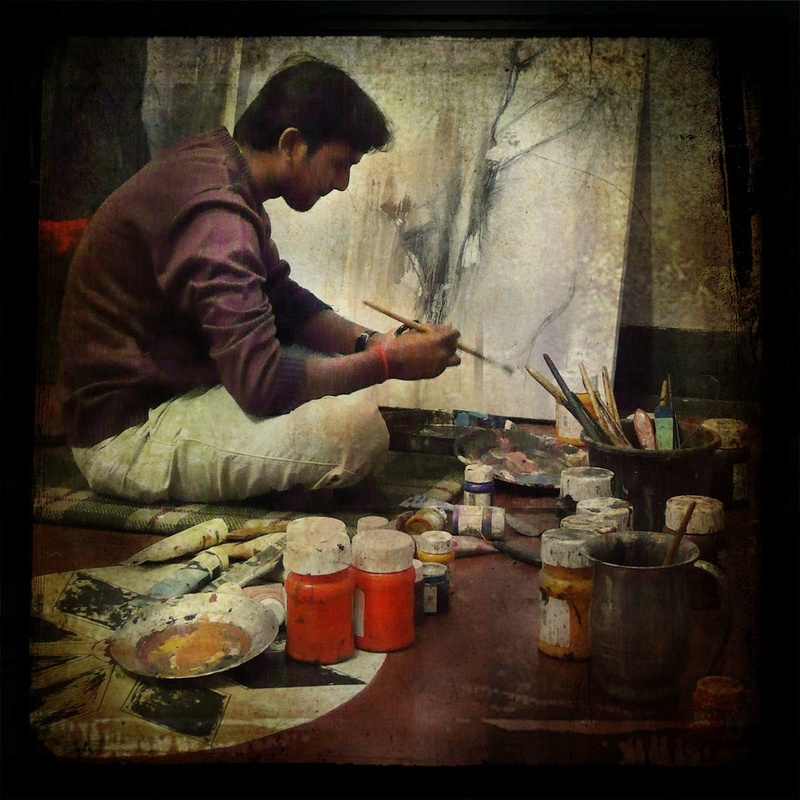 The most successful artists are those that adhere to their studio hours….always! Turn off your phone and your computer. Lock the door. Adhere to the goals you set for painting…no matter what! Force yourself to have the dedication. Create a balance between painting and your time spent online marketing. First things first! Set goals by the number of paintings you complete or the number of hours spent in the studio. Make sure your studio is in ready, working order so there are no barriers to starting a painting. Focus on what you need to get done. Be careful about distractions…creative people are easily distracted! HABIT #4: THINK WIN-WIN. This is someone who sees life as a cooperative arena not a competitive one. The best solutions are the ones that solve problems. Understand who your audience is. Understand the people you are working with. Get testimonials on purchased art pieces. Understand exactly what it is your client wants. HABIT #5: SEEK FIRST TO UNDERSTAND RATHER THAN BE UNDERSTOOD: Are you missing (or have you missed) communication in regard to client commissions? Verify and validate that you understand what the client wants….NOT what YOU want. Communicate with your customer. Tell them what you can deliver. Teaching workshops should be about teaching and giving….not egos. Understand your students, listen, be flexible. HABIT #6: SYNERGIZE. Two heads are better than one. Creative cooperation-teamwork-open-mindedness. Find new solutions to problems. The whole is greater than the sum of its parts. Art can be isolating. Surround yourself in a supportive art community. When you are part of a community your peers can help you with painting problems & share inspiration. Go to galleries, enter new contests, schedule shows for the group. Share on Facebook. Join local and national societies as well as professional organizations. Find art co-ops and non-profits in your area. Join open studios. Join on-line art groups. Reach out for support. Don’t be afraid to ask for help, opinions, or guidance. Read and comment on other’s art blogs. Visit local museums. Artists understand artists. Be “part of”! HABIT #7: SHARPEN THE SAW. Preserving and enhancing the greatest asset you have: YOU!!! Having a balanced program for self-renewal in the four areas of your life: physical, social, emotional-mental, spiritual. Feed your creative energy and strive to learn. Take a class or workshop, try a new media, go to an art gallery or bookstore to see what other artists are doing. Keep a file of photos for inspiration. Stay motivated, learn, try new things. For instance, paint upside down (the canvas, not you silly! ), paint using the opposite hand, take a drawing class or a local art class at a community college. Feed your creativity and strive to learn. Stay healthy and fit. Get much needed rest. HABIT #8: SHARE WHAT YOU KNOW AND GIVE BACK. Remember it is not a competition. Volunteer to teach underprivileged children art. Donate your time and knowledge. Be of service to those in need. In closing I wanted to add my two cent’s worth…..BE A BLESSING TO ALL WHO CROSS YOUR PATH. Have a beautiful week…until we meet again.